South Korea will announce a set of support measures next week for the country's troubled auto parts industry, a top official said Thursday. 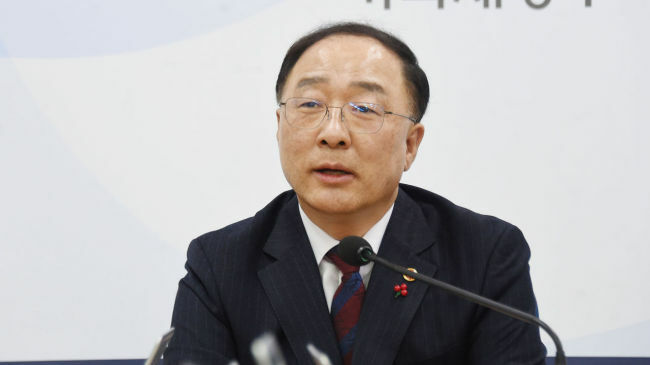 Hong Nam-ki, the minister of economy and finance, said the auto industry is a major priority as South Korea has been struggling to reinvigorate the manufacturing sector, a key part of South Korea's economy. Hong did not provide any further details on the set of measures during a visit to a small auto parts maker in Asan, some 100 kilometers south of Seoul. South Korean auto parts makers face difficulties due mainly to weak sales of cars. Vehicle sales of South Korea's five carmakers fell 5 percent in November from a year earlier on weak overseas demand amid trade disputes between the world's two biggest automobile markets: the United States and China. The five carmakers -- Hyundai Motor Co., Kia Motors Corp., GM Korea Co., Renault Samsung Motors Corp. and SsangYong Motor Co. -- sold a combined 720,892 vehicles last month, down from 758,494 units a year ago, corporate sales data showed. 6.0 percent to 581,030 autos from 618,152 during the same period, the data showed. Hong also said the flexible working hour period could be changed in the coming months from the current three months. He made the comments after the auto parts maker in Asan appealed for a change, citing its difficulty to cope with orders due to the current flexible working hour period.